The Integrative Security Assessment of Smart Grid Cyber Infrastructure project is the biggest project in the Smart Grid subprogram at the Advanced Digital Sciences Center (ADSC). The goal of the project is to produce integrative security assessments for large-scale cyber-physical systems. The Principal Investigators for this project are Professors Zbigniew Kalbarczyk, David Nicol, William H. Sanders, and David Yau. In recent years, many large-scale cyber-physical systems leverage modern communication infrastructure to increase reliability and efficiency. However, this also introduces important security challenges. Attacks like Stuxnet have shown that attacks are beginning to focus on critical infrastructures and can effectively destroy the targeted cyber-physical system. The smart grid is an example of a crucial cyber-physical infrastructure where a failure could have catastrophic impact on every citizen and on the society as a whole. Although commonly it is impossible to make a useful system perfectly secure, the overall security of a system can be improved with thorough analysis. Therefore, it is critical to develop integrative security assessments to secure and supervise complex cyber-physical systems. Providing formal and systematic analysis of different types of security assessment techniques to be applied in the design / implementation / operational phase of the system lifetime as security evidence. Conducting foundational research to develop methodologies for describing different types of security evidence and aggregating the evidence into an overall assessment of the system’s security. 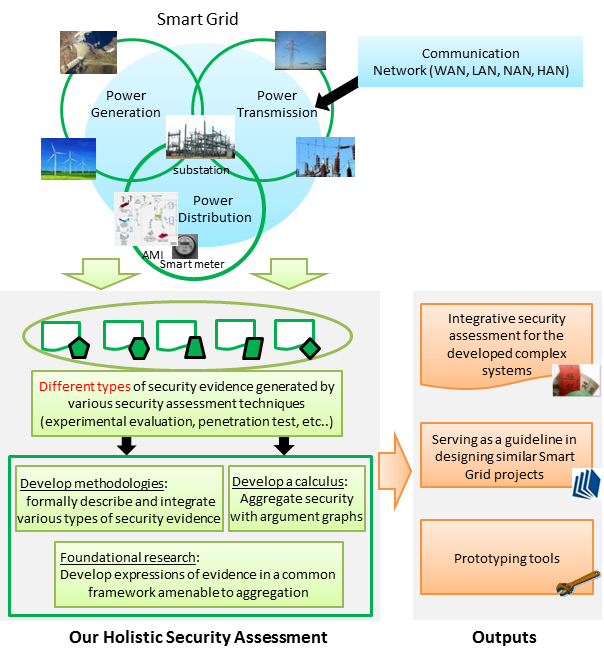 This research provides the following: i) integrative security assessments for large-scale real-world smart grid systems, ii) security guidelines for designing similar smart grid projects, and iii) a prototype tool that implement the methodologies developed in our project to provide integrative security assessments. A smart grid cyber infrastructure is complex, hierarchical, composed of different intricate parts, and keeps evolving. The sources of security evidence are various types of security assessment techniques. These types of evidence may include, for example, expert recommendation, formal proofs, discrete event simulations, experimentation, and penetration testing. Expressing and formally synthesizing these inputs and evidence requires the development of fundamental new approaches, and a framework to integrate the diverse input. That framework should enable the user to assess the security of a complex smart grid cyber infrastructure in an automated way. Automation will facilitate adoption of the tool and enable the user to conveniently assess different design alternatives to compare their merits. We designed a workflow-oriented assessment framework to integrate security evidence and other inputs, to aggregate that input into a central argument graph, and to evaluate the evidence to obtain a security assessment. We have developed a prototype tool that implements our security assessment framework and is able to integrate real-world workflow and system description inputs. We carried out detailed case studies that assess security of specific smart grid applications. We designed an optimal defense strategy based on Markov games. This strategy uses game theory to enable a defender to efficiently allocate her resource on protecting the system. We also investigated fundamental requirements for securing large-scale cyber-physical systems like smart grids, in particular fault-tolerant communication and related questions on complexity. For more information on our ongoing work, please refer to our projects page. The Demand-side Management project: For this project, we provide a security perspective on dynamic pricing and control. We also envision to include models resulting from that project into our assessment framework. The project ReCognize: Reliable Cognitive Radio Networks for the Smart Grid provides novel attacker models and insights for our security analysis, while our framework allows higher-level analysis of the impact of cognitive radio systems on the overall system resilience. The project Towards a Resilient Smart Power Grid is building a testbed and associated tools to facilitate rapid analysis and efficient detection of threats and intrusions to cyber infrastructure in power grid. We are also actively collaborating with peer research institutes, industry partners, and universities in Singapore, including: Institute for Infocomm Research (I2R), Accenture Pte Ltd, IntelliSys, NUS, NTU, and SUTD.